Moving time: 7 hr 35 min. Weather: 58°F (14°C) in the morning; got up to 85°F (29°C) by the end of the ride at 5:30 pm. Pretty much the same as yesterday but mostly cloudy. Today was a big, tiring day. The scenery has become more and more beautiful with every passing mile. I did a significant amount of climbing against a headwind and am now set up for Togwotee Pass tomorrow. The pass lies at 9600 feet - the second highest on the route. The headwinds just beat me up and I had to ride slowly most of the way. Surprisingly I was able to average 10 miles per hour for the day. Construction crews were resurfacing the road before and after Crowheart and there was lots of dust on site. I was supposed to pick up a care package at the Crowheart post office today but it wasn't there. I did get one from my Mom and another from Kelly with some snacks but the main package with my fuel, parts, and food hadn't arrived yet. The postmaster will forward it to Missoula, Montana when it does arrive. 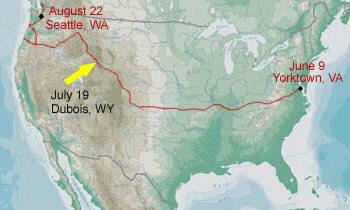 Missoula is far enough away for it to catch up with me but not so far that I'll be out of supplies. 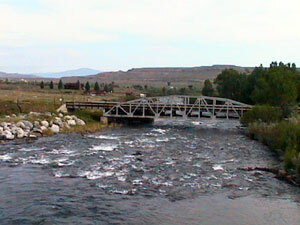 The first shot is of Crowheart Butte; the second is of the Dinwoody River. The rivers are running farily high today since the area has received a few inches of rain the past few days. 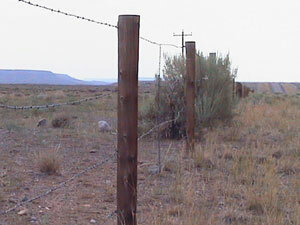 Here's a shot of how the west was won: barbed wire fences. 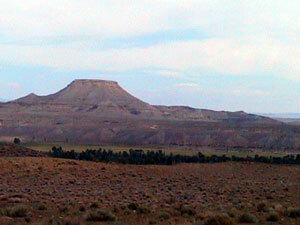 The second shot shows the great contrast that can be seen in a single view. 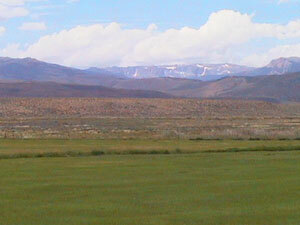 In the foreground is a hay field; farther along is some scrub brush; higher up is a dry mountain range; in the distance is a high mountain range with snow on it. 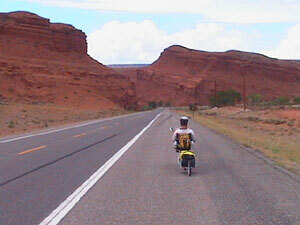 Here's a shot of me riding down a very generous Wyoming shoulder in the Red Rocks along the Wind River. I saw five other cyclists today. Two were eastbounders and three were day riders on an extended trip. The one eastbounder was riding a long wheel base recumbent with a front fairing and panniers. He was cruising downhill with a strong tailwind while I was cooking uphill with a headwind. Joe and I rode with Randy and Chris again today. Chris continues to impress me with his climbing ability. He hustles up mountains like a madman. He jumps out of the saddle, swings the bike from side to side, and just powers up even the longest of hills. Of course, I pass him on the downhill stretch when my ultra-aerodymanic recumbent shows the hill who the boss is. Overall, he is a much better rider than I am - my bike just makes up for the difference. We all stayed at the Aspen Meadows Bike Hostel about nine miles west of Dubois, Wyoming. Joe and I arrived just as it started to rain steadily. Randy and Chris arrived before us and were just getting settled in. This is the thrid day of rain here and they could use it! Dave Martin and his wife open their home to cyclists for dinner, a hot shower, laundry, and breakfast before heading out in the morning. They have a cabin next to their home that cyclists can stay in. The hospitatlity is excellent and the food is awesome. Food: 3 packets cream of wheat, 3 packets sugar, 1 packet apple cider, nutty buddy (210 Cal. ), pint chocolate milk (400 Cal. ), 1 L Gatorade (200 Cal. ), 2 NutriGrain bars (280 Cal. tot. ), 2 Nature Valley bars (280 Cal. tot. ), huge grilled chicken sandwich, onion rings, pickle spear, 1/2 lb. pasta with meat sauce, salad with Italian dressing.